OFFICE NINJA can be described as the marriage between The Office and Being John Malkovich. Dry with and dark humour guaranteed. Come along for the ride! A dark and witty satire on office life, set in a large office complex about 20 minutes outside Stockholm. On one of the myriad identical office floors resides Helm Tech, a company in the “safety market" providing bicycle helmets to the Swedish consumer. Jens Jansen, a brand manager at Helm Tech, has up until now lead a very ordinary middle class life. As a middle manager, Jens Jansen does his outmost to avoid actual work. His mundane life depresses him, but he's unable to change it. His marriage is in ruins, but he couldn’t care less. When Jens suspects he will be promoted, thus being forced to do actual work, he plans his own disappearance. But he does not travel the world, no, he hides in the office, in the server room that no one uses. He crawls through the ventilation system to go to the bathroom, drinks from the water cooler, eats his colleagues' lunches. He is so ordinary that it takes weeks before anyone at the office realizes Jens is in fact no longer there. "Lars Berge’s ‘The Office’-inspired debut is a quirky contemporary farce that ends in a knock-out punch, an intelligent satire on the management culture that has elevated empty rhetoric into law." 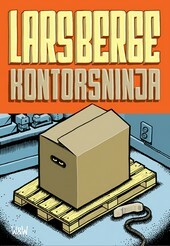 "With Office Ninja, Lars Berge has succeeded in hitting a raw nerve in social development. Not even Ricky Gervais in the TV series ‘The Office’ managed to make modern working life seem so frightfully empty."